A proficient preclinical partner facilitating drug discovery research with dedicated multi-disciplinary team in pharmacology, DMPK, Safety pharmacology, Toxicology and Bio-analysis , VIMTA is a "One-Stop-Shop" for discovery research. Benchmarking and redefining quality through an ultra-modern AAALAC accredited and GLP certified facility for leveraging global data acceptability. VIMTA adds value through reliability, quality, time management and cost-effectiveness. A proficient preclinical partner facilitating integration of multiple scientific disciplines and evaluating relationships of dose, exposure, safety & efficacy. VIMTA provides critical preclinical research data and innovative solutions through conduct of right studies at the right time using proven experimental design, quality compliant management systems, experienced professionals, and state-of-the-art facilities with current technologies. All work has at its core scientific and operational excellence. With dedicated multi-disciplinary team in Pharmacology, DMPK, Safety pharmacology, Toxicology and Bio-analysis, make VIMTA a “One-Stop-Shop" for discovery & development research. VIMTA is an AAALAC accredited and GLP certified facility, thereby enabling global data acceptability. We add value through providing accurate, reliable, timely, cost effective and quality services. We have established a strong track record of completing several projects in IND / NDA-enabling general toxicology and safety pharmacology studies. VIMTA has a whole range of services dedicated to early phase drug candidate selection and development, where test item quantities, time to results and price are optimized for fast and robust decision making. We have established various in vitro / in vivo models which allow evaluating the efficacy of your molecule and establishing PK-PD relationship. Our tailored approach derived from diversely trained group of scientists at pharmaceutical and biotech industries, helps our clients fast track efficacy and safety testing to support lead identification & optimization. The routinely employed models can be fully integrated with histology, pathology, immunohistochemistry, flow cytometry, telemetric readouts and behavioral assay. A range of integrated laboratory services are also available with partners in the biomedical cluster to ensure maximum value is gained from every study. Selection of drug candidates with the best ADMET properties should enhance the probability of clinical success. VIMTA offers the complete package of ADMET studies which are critical for clinical success. In vitro human-based experimental system used in combination with in vivo animal systems, using animal species relevant to humans, represent the best approach to assess these important drug-like properties before clinical trials. Our objective is to design the studies that are necessary for your molecule in the most efficient and cost effective way. All in vitro and in vivo studies are performed under strict quality control. Our highly qualified bioanalytical specialists work to flexible and effective communication lines, ensuring optimal efficiency in delivering results. With complete scalability, VIMTA’s laboratories are fully equipped to control a variety of sample streams ranging from non-GLP fast screening studies with only few samples, to pivotal GLP nonclinical studies. Different matrices tested include rodent and non-rodent plasma. Proprietary method development & validation on NCEs & method transfer along with Metabolite identification, profiling & structure elucidation are available with fast turnaround time for your projects. Our discovery and drug candidate selection services include all the essentials for lead optimization and drug candidate selection, from the earliest genotoxicity assays to background data in support of multi-endpoint in vivo toxicology studies. VIMTA is ideal partner for building efficiencies in your drug developing process. Our commitment is to provide a fast and reliable route to clinical phase I - II studies. Quality and flexibility are key factors in our work. We work closely together with our customers and ensure that no regulatory studies are overlooked that are required for IND filing. VIMTA delivers full range of IND toxicology services, supported with nonclinical formulation development and analysis, and complete toxicokinetic analysis and interpretation. Routine collaboration with our in-house experts in bioanalytical / analytical sciences, immunology, clinical and anatomic pathology services, safety pharmacology, and other disciplines enables us to conduct studies with integrated endpoints for faster, cost-efficient results, and to provide a comprehensive integrated study report. HERG assessment using planar perforated patch clamp technology is employed to evaluate the electrophysiological changes which can induce cardiac arrhythmias by altering duration of repolarisation, represented by the QT interval. Adverse effect may be suspected based on the pharmacological properties or chemical class of the substance or concern may arise from safety pharmacology core battery or clinical trials. Hence, such potential adverse effects should be explored in supplemental or follow up studies. VIMTA is a leading CRO in India with over 20 years of experience, providing high quality services in non-clinical research management to pharmaceutical and other health-related organizations, across the globe. Extensive experience of our team with general toxicology and reproductive toxicology studies of high complexity, and their ability to respond to, and troubleshoot unexpected issues, enable us to achieve robust, regulatory compliant data with fast turnaround. 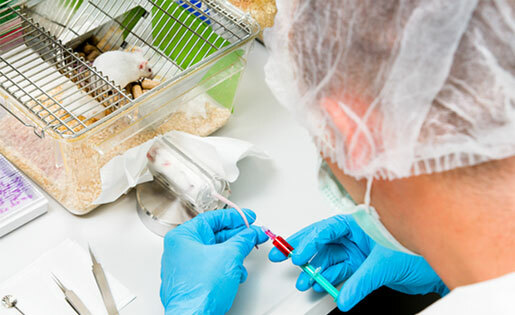 VIMTA offers a comprehensive package of mammalian toxicology study types aimed at meeting the post INDs toxicological studies requirements of the pharmaceutical and biotechnology industry. VIMTA offers 2-year carcinogenicity studies in rats / mice by oral gavage can also offer topical and parenteral administration as appropriate for the expected human dosing route. Designs for carcinogenicity studies generally follow the guidelines published by the ICH, but are also designed to comply with the requirements of regulatory agencies including US-FDA, JMHW and CPMP (for Europe). The Developmental and Reproductive Toxicology team at VIMTA has the capabilities and the latest technologies to conduct all the developmental & reproductive toxicology study types. Studies are designed to test the effect of drug (including small molecules and biologics) on fertility, embryo fetal development, prenatal and postnatal development and maternal function. Our expertise in the field of neonatal and juvenile animal studies has also been validated. VIMTA’s team is passionate to support emerging business and scientific strategy to make new, enhanced and differentiated therapeutic benefits a reality. Our strategy often relies heavily on published literature, existing risk-benefit profiles and opportunities to run parallel studies to building and executing a robust nonclinical program to reduce short and long term costs. In the nonclinical stage, we identify suitable studies to demonstrate safety and efficacy, abridging the process of the new product. VIMTA offers the complete package to support qualification of impurity. Our objective is to design the studies that are necessary for your product in the most efficient and cost effective way. All in vitro and in vivo studies are performed as per ICH guidance document under strict quality control. Our comprehensive package is designed based on product specification. Safety evaluation studies (in vitro and in vivo) are conducted on a variety of biomaterials, medical devices, and related products to identify the presence of toxins or any other potentially harmful effects. VIMTA offers Biocompatibility testing, which ranges from the initial screening of new materials to product release testing, periodic audit testing, and non-clinical or pre-market safety evaluations to meet current US-FDA and international standards. These studies are designed following accepted international standard (ISO10993) in conjunction with United States Pharmacopeia (paragraphs 87 and 88) for devices made from plastic, metal, ceramic, absorbent and biodegradable materials. The rate of release of an active pharmaceutical ingredient (API) from a topical semisolid dosage form can be influenced by its physical and structural properties. An In Vitro Release Test (IVRT) is an established analytical method to characterize this rate of API release across a non-interactive membrane (synthetic membrane or skin) into an appropriate receiving medium and compare the underlying sameness in pharmaceutical and cosmeceutical product quality characteristics. The United States Food and Drug Administration (U.S. FDA) recommends the use of IVRT to assess equivalency between pre and post change batches after certain post-approval changes, such as manufacturing site or process changes (changes in batch size beyond a factor of ten times the pivotal/clinical batch, change in equipment to a different design, changes in crystalline form of API, changes in excipient, process change such as rate of mixing, mixing times, rate of cooling, operating speeds, holding times outside approved application ranges ) or different operating principles, changes in excipient supplier or grade, changes in the components and composition of the drug product, or changes in batch-size in approved products. IVRT also allow appropriate selection of a clinical candidate with Quality by Design principles (QbD), and can serve as a cost effective means to monitor the consistency in manufacturing of semi-solid dosage forms during clinical trials. With recent expansion in In vitro Biowaiver capabilities, we further strengthen our capability to address the challenges our clients encounter during topical drug development. As a responsive to our valued client, experienced team of Vimta has designed and qualified vertical diffusion cells appratus (Franz diffusion cells), validation of the HPLC analytical method, and validation of numerous critical parameters of the IVRT method, which resulted in a comprehensive and successful IVRT method validation. Vimta is proud to announce that we are now offering single and repeat dose inhalation studies in rodents via nose-only exposure system. Our state-of-the-art facilities, units for nose-only exposure for rodents combined with real-time monitoring of a variety of parameters by experienced personnel ensure well-controlled testing systems and delivery of high-quality studies. We have specialized capabilities in place to offer complete separation between exposure to different dose-groups. Our research and services in Inhalation area are focused on the investigation of effects of airborne materials, in compliance with OECD-GLP guidelines, whenever required. Test item can be chemicals, environmental pollutants, or pharmaceuticals including biologics, which require testing as part of the registration process. In addition to a complete range of GLP toxicology studies to support your regulatory submissions, we also offer exploratory and pharmacokinetic assessments. A broad range of project types, from the development of evaluation concepts to the realization of complex test designs are offered. Our interdisciplinary team allows us to deal with measurement of Inflammatory reactions in the lung, enzymes and cytokines in bronchoalveolar lavage fluid, clinical chemistry, and hematology, histopathology and immunohistochemical endpoints, genotoxicity and safety pharmacology of the respiratory system. Vimta’s dedicated method development teams have extensive experience of developing and validating robust analytical and bioanalytical methods in compliance with GLP. Our comprehensive analytical and Bioanalytical capabilities and purpose designed modern laboratories ensure timely and reliable results in keeping with our clients’ timelines.